Contributions announced at Oct. 17 Weltner Award Banquet will help educate Georgians on the public’s right to access public documents, meetings and proceedings. The Georgia First Amendment Foundation has received pledges, sponsorships and individual donations adding up to more than $136,000 — a robust display of support for protecting and expanding open government in our state. The funds were contributed in conjunction with the foundation’s annual Weltner Award Banquet on Oct. 17. The banquet, which honored Cobb County Superior Court Senior Judge James Bodiford, was one of the nonprofit’s most successful fundraisers ever, attracting more than 120 attendees and 11 event sponsors. During the banquet, The Atlanta Journal-Constitution and Channel 2 Action News announced an $80,000 donation that the foundation will use to provide open government training across Georgia. In addition, the Department of Journalism at the University of Georgia’s Grady College of Journalism and Mass Communication announced a generous donation through its William S. Morris Chair in News Strategy and Management. The university will provide $10,000 to update the foundation’s popular open government guidebooks. The Georgia Press Association also is contributing $1,000 toward the guidebook revisions. The AJC, Channel 2 and the City of Atlanta recently settled a complaint that the newsrooms filed in April with Georgia Attorney General Chris Carr. The complaint alleged “a culture of political interference” with open records requests under the administration of former mayor, Kasim Reed. Under terms of the settlement, the city council and new Mayor Keisha Lance Bottoms agreed to take substantial steps to increase transparency and also to pay the news organizations $80,000 as partial reimbursement of legal fees. That settlement money will fund the news organizations’ donation to the foundation. Alex Taylor, chief executive officer of Cox Enterprises, parent company of the news outlets, said in a statement, “We couldn’t be more proud of the team at WSB-TV and The Atlanta Journal-Constitution for its watchdog reporting on this incredibly important matter and proving, once again, that local journalism matters. At the banquet, Bodiford accepted the foundation’s 2018 Charles L. Weltner Freedom of Information Award, making him the 17th honoree to receive the award. It was presented by Amelia Weltner, granddaughter of the late Georgia Supreme Court Chief Justice Charles L. Weltner, an unyielding champion of government transparency for whom the award is named. The foundation recognized Bodiford for his 30-year commitment to protecting the public’s right to courtroom access. The Cobb senior judge kept his courtroom open while presiding over some of Georgia’s highest-profile criminal cases. In his keynote speech, Bodiford encouraged other judges to remember that the judicial system needs “the confidence of the public” to succeed. “The more they know, the better they’ll feel about it,” he said. 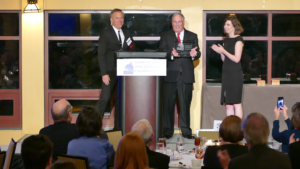 >>> Watch WSB-TV Channel 2 Action News’ report, read The Atlanta Journal-Constitution’s article about the donation and check out the Daily Report’s coverage of the foundation’s 2018 Weltner Award Banquet.